It’s a truism that reputation, having taken years to build up, can be lost very quickly. Over the past few weeks we have been reminded of that by, amongst others, British Airways with its disastrous IT crash, as well as by a certain UK political leader who ill-advisedly called an unnecessary general election. For any large organisation, being in good standing with your customers, or the public, is much more than just a ‘nice to have’. New research from the company Reputation Dividend suggests that reputation accounts for a massive percentage of the value of our leading quoted companies. The study suggests that by January 2017 the figure for the UK’s FTSE350 firms had risen to a record level of nearly a trillion pounds, or 39% of all shareholder value. So it goes without saying that maintaining a strong reputation should be a central objective for any company boss or public sector leader. Effective media engagement can play a key part in this, though it is a lesson not all business leaders have yet learnt; I still hear advice being given to ‘avoid journalists as they only want bad news’. The truth is that the media, whether you look at your headlines on TV, via Facebook, Huffington Post or on the printed page, are hugely influential in shaping opinion. 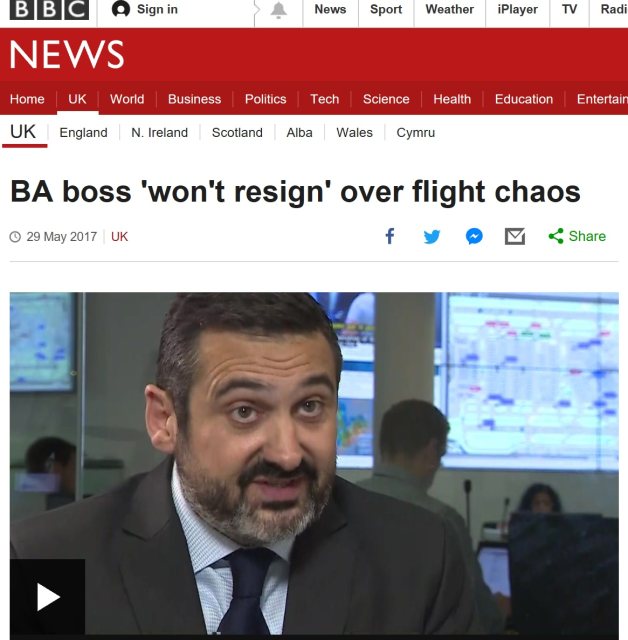 The fact that BA’s boss Alex Cruz was so slow to come forward and speak to reporters was widely seen as a major factor behind passenger anger over cancelled flights – people wanted to see real contrition, as well as a clear explanation of how such a damaging failure could have been allowed to happen, and what was being done about it. Similarly during the election campaign Theresa May seemed unwilling to engage, and ducked out of the main leaders’ debate – to her detriment. This is why it remains so vital for business leaders to be ready to engage in an authentic manner when the time comes, which may not be of their own choosing. For most people this takes a lot of practice, not to mention high-quality media training, that does not turn spokespeople into on-message robots. Yet at the same time we frequently hear that peoples’ trust in the media continues to be eroded – we don’t know what to believe. Released last week, the Digital News Report from the Reuters Institute for the Study of Journalism, covering 36 countries, found there are high levels of scepticism about news and comment, with 33 percent of consumers polled saying they can’t rely on the news to be true. But if people have less trust in traditional media channels, they are even more suspicious about social media. Nic Newman, lead author of the report, is quoted as saying that “Although mainstream media is not trusted, it is still trusted twice as much for separating fact from fiction as social media.” He even argues that fake news could be the best thing that has happened to journalism in a long while, seeing it as an opportunity to re-establish the value of mainstream brands and focus on quality. This will take time; the battle for credibility will be one for the long haul. But I believe just staying on the sidelines is no longer an option for our leaders. Reputation is too valuable for that, and needs to be fought for. If you are in the firing line, you need to be able to convince people that if something goes wrong, it is despite you and your organisation, not because of you and your organisation. For that, you need to get the media on your side as much as you can, even through the tough times.